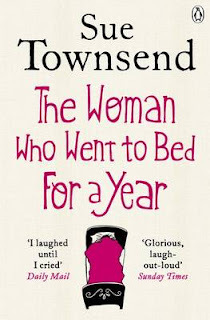 Book Review: Sue Townsend's "The Woman Who Went to Bed for a Year"
Home » books » review » Book Review: Sue Townsend's "The Woman Who Went to Bed for a Year"
I hope all readers of this blog are enjoying the festive season. One of my favourite days of the holidays is Boxing Day. We have never been a family who does much the day after Christmas, and for that I'm grateful. 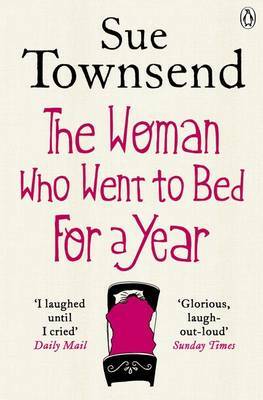 Today was spent on a lie-in, some delicious leftovers, watching DVDs, and finishing this latest offering from Sue Townsend. Adrian Mole kept me joyously entertained when I was an adolescent. I look fondly on that time when I was eleven or twelve, and marveling at Townsend's ability to make me laugh. This nostalgia is partly why (of all the books at my parents house, and there are many) I decided to pick up this one. This book has some great moments, primarily due to Townsend's exaggerated, larger than life characters. Brian is the epitome of the middle aged man trying to recapture his youth by sleeping with a younger woman, and this leads to several hilarious scenes. The twins are hyper-intelligent, and extraordinarily lacking in emotion. And I can't neglect to mention Poppy, the twins' new university 'friend', flirt, and serial liar. Yet, the book also makes some interesting observations on the mass media society we live in. The fact that Eva becomes a twitter sensation, and that people begin travelling from around the world to visit this 'angel', illustrates the extreme lengths people are willing to go through to find a bit of faith. And ultimately, that seems to be what Eva has lost. She's spent years in an unhappy marriage, settling for a life that she never really wanted. If there is anything wrong with her, it's apathy. The story is about learning to feel again, about self-discovery minus all of the everyday flotsam and jetsam. While, the ending is a bit of an anti-climax (she's gets out of bed), the book is a good easy read, with some extremely funny moments. It's not as good as the Adrian Mole diaries (I may have to revisit those diaries), but it's still worth a look if you're after something light over Christmas.